To me this herb is the typical super plant disguised as a total weed. 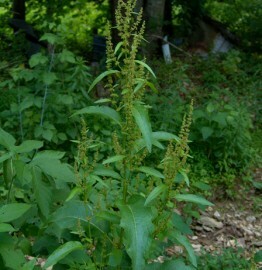 You see this herb growing practically anywhere, from under some old tires, on the side of the road or in your driveway. A big loser with a very weedy demeanor. One would think it’s completely useless sitting there all green and turning brown and crispy in the fall. But dig that root up in October and have one smell, one taste and you will find a very fine, bitter medicinal herb. Yellowdock root can be harvested during autumn when the plant stalk is completely brown. The root can be cleaned off, sliced and dried somewhere with good air circulation and then used in a tea or tincture. When in a tea most roots need to be decocted, meaning boiled for twenty minutes, then strained. Yellowdock acts as an overall blood cleanser and is an excellent herb in dealing with skin problems. The leaves, stalks, flowers and seeds are all edible, though the leaves are high in oxalic acid and would not make a good daily staple. Please check out my youtube videos about Yellowdock for more information.